An 80 Year old female living in nursing home comes to her doctor for the interpretation of her tuberculosis (TB) skin test. 5-tuberculin unit injection of purified protein derivative (PPD) was interpreted as 0 mm diameter of induration after 48 hours. What should be the next step? A) Repeat the PPD now. B) Repeat the PPD in 2 weeks. C) Repeat the PPD in 1 year. D) Declare the patient free of TB. E) Obtain a chest x-ray. Individuals admitted to a nursing home with a positive PPD and no symptoms of active TB may be presumed to have a distant history of infection. The PPD is repeated 2 weeks later and is interpreted again as 0 mm diameter of induration after 48 hours. The patient is reassured that her tuberculin test is negative. 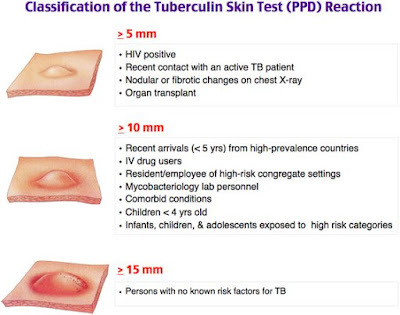 What would most accurately represent a positive tuberculin skin test in THIS patient? A) Erythema 5 mm in diameter. B) Induration 5–10 mm in diameter. C) Erythema of 10 mm in diameter. D) Induration 10 mm in diameter. E) Erythematous induration of any size. Routine screening is not recommended for low-risk patients (e.g., community dwelling individuals from a low-risk country). nursing home and other institutionalized individuals and the homeless. Measure the induration and not the erythema. The definition of a positive PPD changes with the population tested. Very informative and well written post! Quite interesting and nice topic chosen for the post Nice Post keep it up.Excellent post. Keep up your work.Thanks for sharing this great article. Great information thanks a lot for the detailed article. Effect Of Hyperuricaemia On Kidney.